 Symbols. Waterfalls. Basements. Mythology. 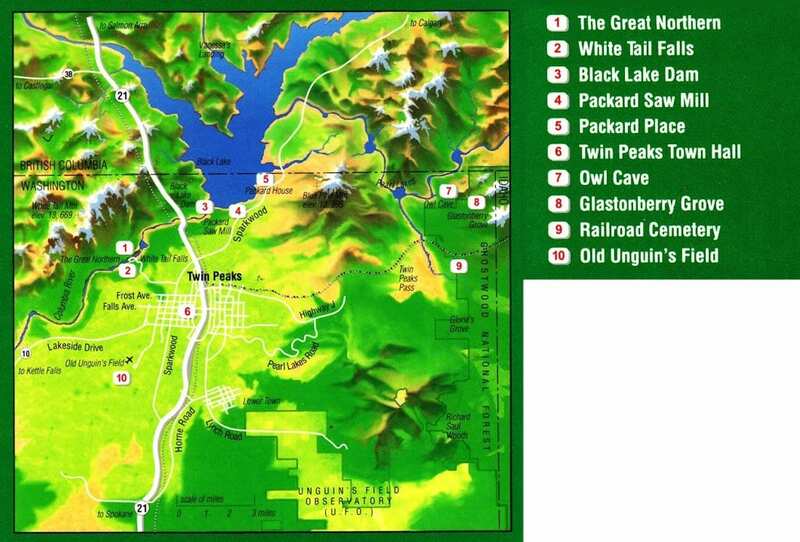 The maps of Twin Peaks. The red curtains. Laura, Teresa and Maddy. The secretive work of Major Briggs. Alchemy. Rivers. Portals. 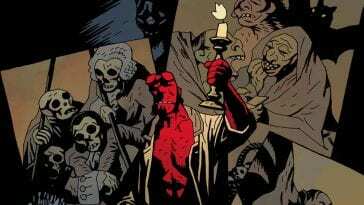 Demons and entities. The sound at the Great Northern. Mountains. Caves. Visual analysis. The Black Lodge. Rivers. The palace of the Fireman and Señorita Dido. Mike. Time. And, maybe most importantly, Johnny Horne’s head injury. These are my keywords for this article. Yes, I will be writing about many different things – yet they’re all somehow connected, and I intend to find out how. The big challenge is that, since everything is connected, there’s an infinite number of things that one could choose to include. It’s harder to exclude something than to keep the brain from making a million new and different side paths all the time. And that’s what my brain does. Twin Peaks makes it spin so fast I’m holding on tight to spin along. This article is a long one but I’m hoping that you will come along because I have some really interesting stuff to show you. So, what’s this about Johnny Horne’s head injury? It is actually what made me write this article, to begin with. I know that might sound strange, but bear with me – I will explain. Twin Peaks has a mirror-world. It is the town’s own “shadow self”, an underground doppelgänger. In other words: Twin Peaks has an Underworld. 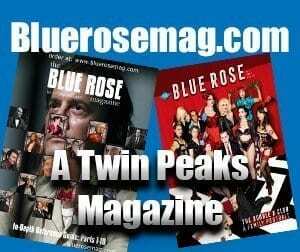 The Underworld of Twin Peaks is a metaphysical sphere that is accessible through many different paths and portals. Water is strongly connected to the spiritual forces of the Underworld. White Tail Falls, the waterfall by The Great Northern, is particularly important. There are some strong parallels to Twin Peaks in Sumerian, Native American and many other mythologies. 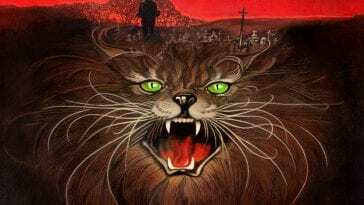 There are visual and thematic similarities to be found as well – sometimes they are strikingly literal, sometimes simply just interesting to consider. 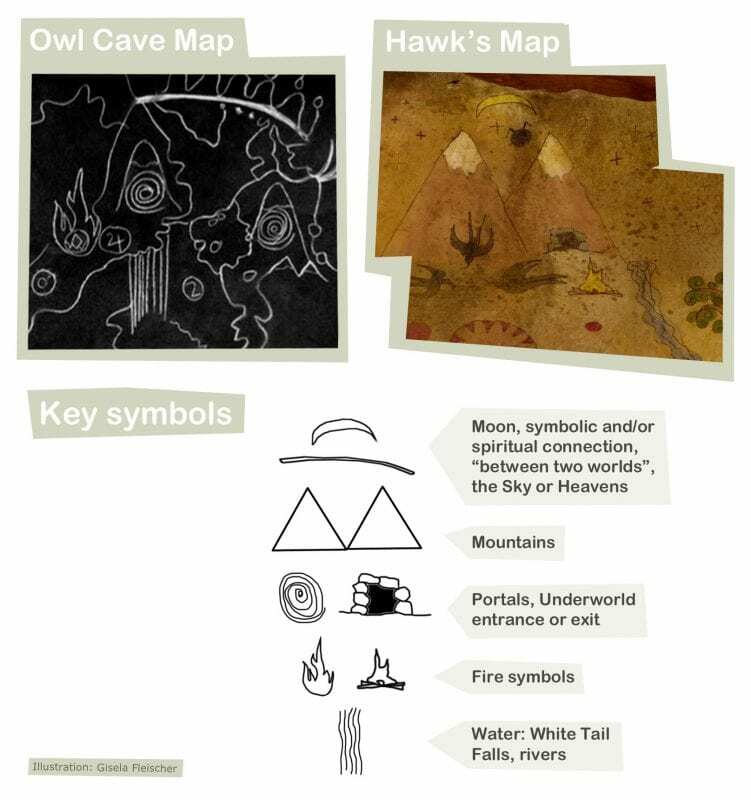 There are clues to the Underworld and the spiritual realm to be found in both the Owl Cave map and in Hawk’s map. Mike has a sound, and the sound can make people behave in certain ways. There are portals in The Return that are very hard to find even if you have the exact coordinates. 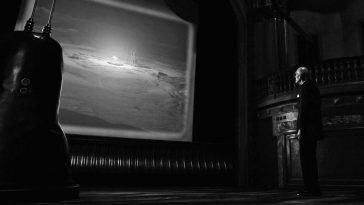 White Tail Mountain and Blue Pine Mountain (the twin peaks of Twin Peaks) are gateways to “otherworlds” and both have or have had “magicians” chanting out “between two worlds” – but yet, they are also different. Will I find any of these statements to have any bearing? I’ll try to find out and show you what I find along the way. Let’s go. That’s all he has time to say before he’s ordered by US Air Force personnel to go with them. 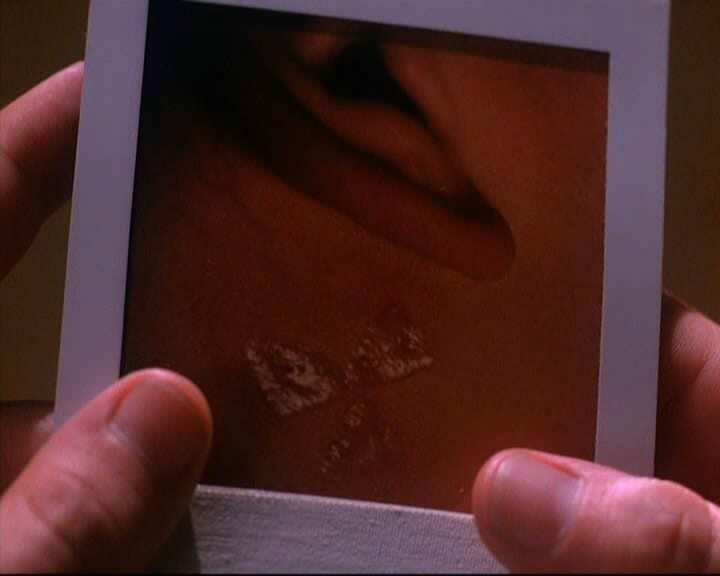 As the Major leaves, drops of water fall onto the Polaroid of the triangular markings behind his right ear. 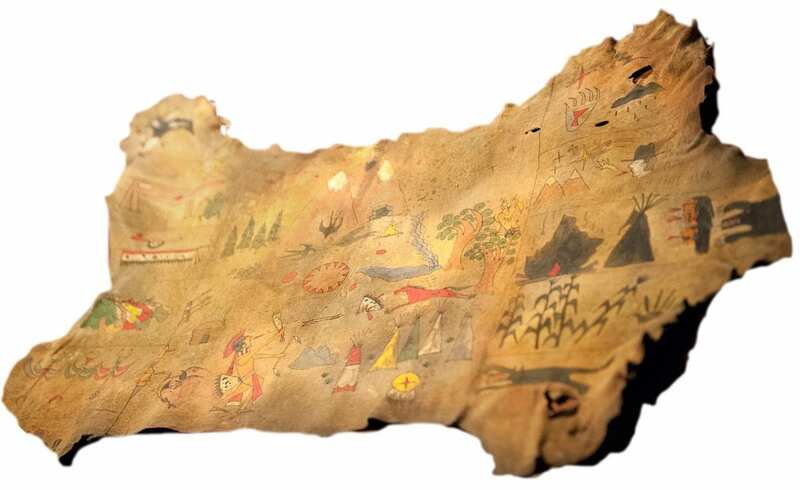 Hawk’s map analysis – Interpreted using Native American art history, mythologies of the Great Plain tribes, symbolism etc. 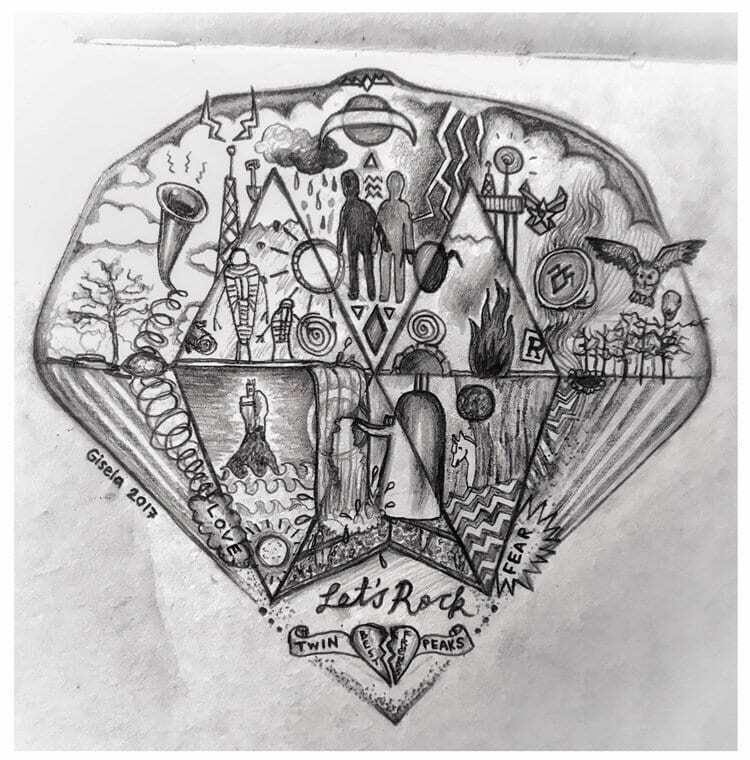 Owl Cave map analysis – An alchemical reading of the map (as a part of a big Alchemy and Twin Peaks analysis) where I, apart from alchemy, also used astronomy, Native American symbolism and hermetic views of the enlightenment of the Self. The Moon has strong symbolic meaning in alchemy. It is associated with silver, one of the base metals, a so-called feminine principle and strongly connected with spirituality, dreams, vision, divinity and wisdom. The Moon is also a bearer of psychic importance. The alchemical symbol is the same for the Moon and for silver. Interestingly enough, the first man-made mirrors were made with silver. Silver (and the Moon) therefore also stands for self-reflection and for mirroring in a more symbolic sense of the word. Twins are mirrors of each other, and the twin mountains mirror each other as well. I will return to this topic later. This “moon shape” is, of course, symbolic if it is to be viewed as a bridge between the mountains. 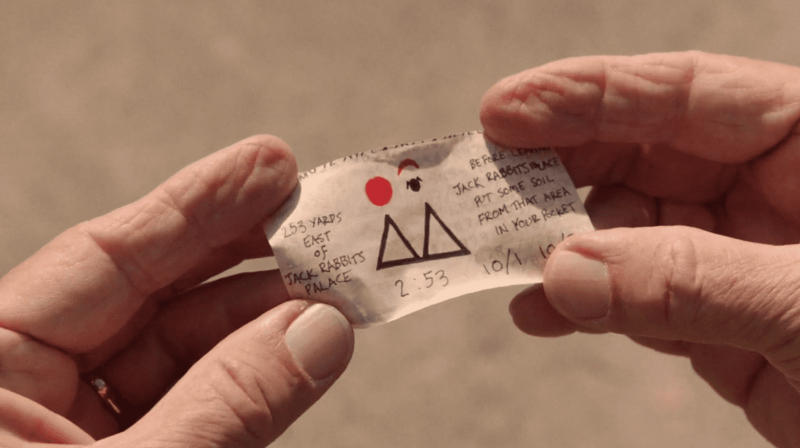 I’ve personally always had a feeling that there’s a path of communication and an almost electrical charge between White Tail and Blue Pine, causing things to happen in between the two – Twin Peaks, the town “between two worlds”. Fire symbols – I have already written a lot about the meaning of fire, so I’ll not repeat myself too much. 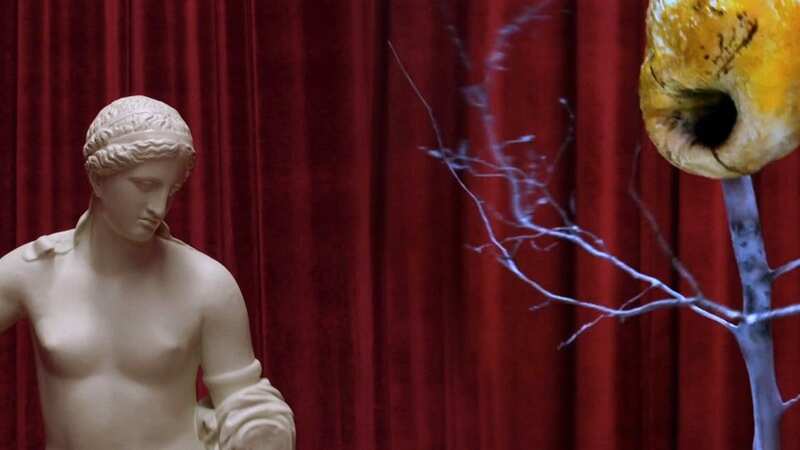 Apart from having a huge mythological meaning in the Twin Peaks universe, fire is also connected to everything from strength and survival to lust, fear death and aggression. Alchemically, fire is one of the four elements and fundamental to the alchemist’s work trying to refine lesser metals into gold. This is not purely a chemical process, however. The alchemist also (and perhaps foremost) strides to metaphorically turn their “‘inner lesser metal’ into ‘gold’. It is, in other words, the path to enlightenment and spiritual perfection of the highest kind” (see Twin Peaks and Alchemy for a lot more on this process). Fire, therefore, is a tool for and a sign of spiritual excellence. Fire is neutral – as Hawk put it: whether it becomes a tool for good or evil ”depends on the intention behind the fire”. 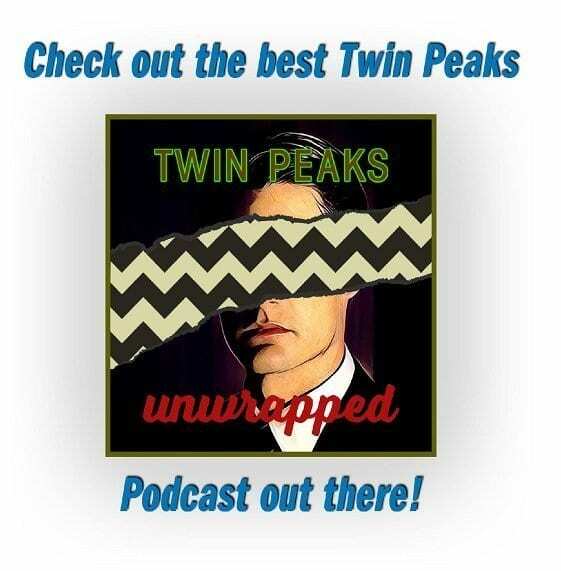 The “evil” twin Mr C has intentions that leads to the Black Fire of death and destruction – the “good” twin Dale Cooper has other intentions, but what he causes instead is another story. White Tail Mountain – This is where Dr Jacoby (or Dr Amp) hangs out in The Return. He mentions the mountain in is home-made broadcasting show. Thus we have a sender of information sitting on this west peak. Remember that for now. The peak of the mountain range Hindu Kush (in South-Central Asia) is called Tirich Mir which, peculiarly enough, means “king of darkness” in Wakhi. This is a fact that might seem to contradict my upcoming elaboration on the different traits of two peaks just a little bit, but I wanted to include this since it seemed fitting none the less. Maybe it isn’t contradictory at all. Without darkness, light wouldn’t be noticed – and the same goes other way around. Darkness is really as neutral as fire – it’s the intention behind the darkness that matters. Also on the White Tail Mountain is the lookout spot where James, Donna and Laura went to have a picnic two weeks before Laura’s murder. 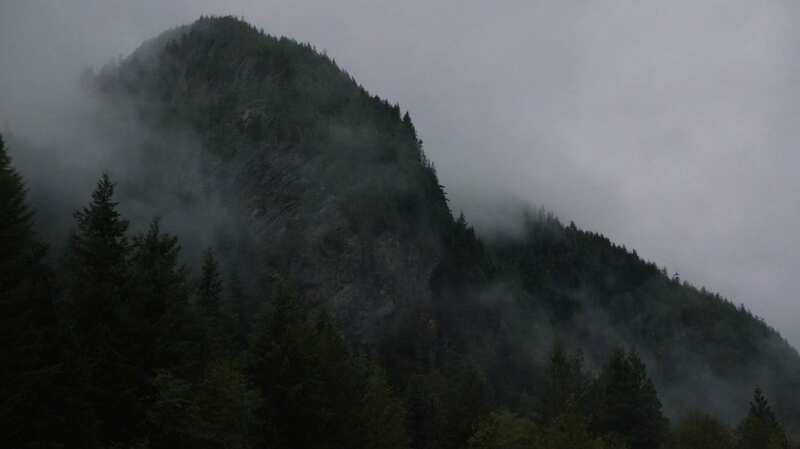 By the base of the mountain, one of the most famous sceneries of Twin Peaks is found: the White Tail Falls, the big waterfall, and right above it the Great Northern Hotel. We have good reasons to revisit both the hotel and the waterfall later. Nearby flows the Colombia River that finds its way between the rugged terrain on the long journey to the ocean. Just before falling from White Tail Falls, the river has passed the Black Lake which lies right between the two mountains to the north of the town centre. In short: White Tail Mountain doesn’t seem to be associated with the more “evil” aspects of the town (or the series). Whether this is the case or not I’ll get back to soon, but first, let’s visit the other side. The Owl Cave. Glastonbury Grove. The Log Lady’s cabin. The train car where Laura was murdered. Pearl Lakes, childhood summer home of Leland Palmer and the place where Bob first possessed him. Jacques Renault’s cabin. Windom Earle’s hide-out. And on the other side, by the waters of Black Lake, is the place where Pete Martell found Laura dead that February morning in 1989. (The house next to it where Josie, Catherine and Pete lives, is called the Blue Pine Lodge). That is, if the murder ever happened. Right on the high slopes of the Blue Pine Mountain is where Major Briggs had his Listening Post Alpha station. This is where he received information from “the earth below”. It’s interesting to me that there’s yet one hub for communication on this mountain, just as there is on the twin mountain on the other side. One is sending, the other one receiving, but they’re both driven by individuals who are searching for “the truth”. Like true twins, mirroring each other, each mountain has (or had) its own “magician” that “longs to see”, both chanting out “between two worlds”. Deep inside the Owl Cave, the secrets on how to access the Lodge and when is found. Glastonbury Grove is an entrance to the Black Lodge. Here are the twelve Sycamore trees and the pool of scorched engine oil designed to evoke fear for Bob and his familiars to feed on. There is talk about an “evil in these woods” that has been known for a long time. 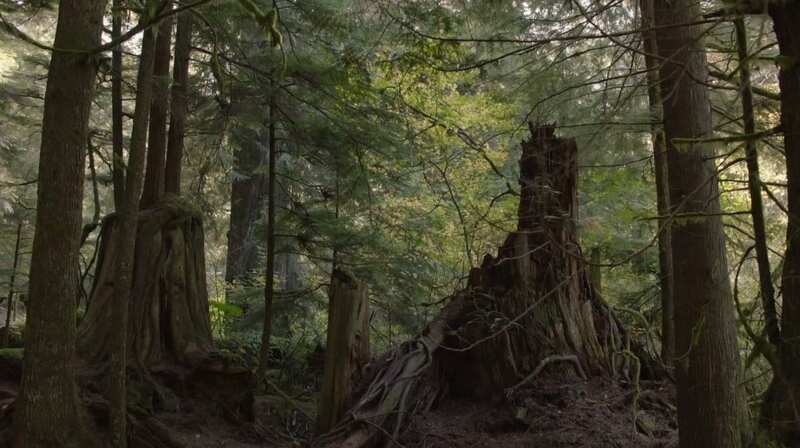 Maybe this is the source; after all, the place is referred to as “the heart of the forest”. Jack Rabbit’s Palace and its nearby own version of Glastonbury Grove (with the one Sycamore tree instead of twelve and a pool of liquid gold instead of oil) are new places both introduced to us in The Return. According to Bobby, Jack Rabbit’s Palace it’s located pretty close to the Listening Post Alpha station, and it’s therefore also connected to Blue Pine Mountain. 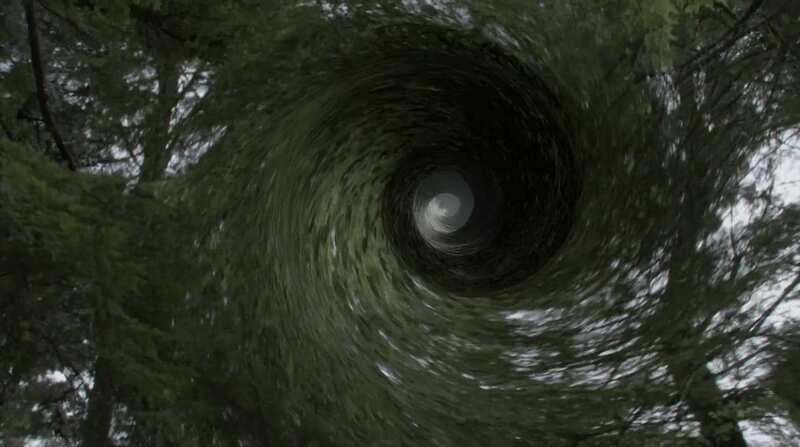 After seeing both Andy and then Mr C pass through the portal there, it seems to me that the place is neutral in nature. By this, I mean that it seems to matter who you are and what intentions you have when you go there. Andy and Mr C are very different persons, to say the least, and their visits are very different in nature, too. We interpret the halls of The Fireman and Señorita Dido as “good”, so why isn’t the portal by Jack Rabbit’s Palace situated on the White Tail Mountain? Might it be a trap set up to capture entities like Mr C? I think it’s more likely that it has to do more with something else. From what we’ve seen in The Return, it seems to matter who enters this portal and how – the Fireman seems to have the power to entrap, send through or even summon visitors according to his will. Blue Pine Mountain is the stronger, more spiritually charged mountain of Twin Peaks, and that’s why both Jack Rabbit’s Palace and Glastonbury Grove can be found in its proximity. Douglas Milford – Major Briggs’ predecessor – knew about the spiritual activity of the woods and land surrounding Blue Pine before he became part of building the Listening Post Alpha station high up near its peak. In order to catch the “messages” from the local area, one must stay close to them. Another “good” exception from the rule of dark magic and “evil” spiritual activity around Blue Pine Mountain is the Log Lady. Her cabin is situated in the middle of everything, very close to Glastonbury Grove – also called “the heart of the forest”. The Log Lady’s home seems protected. She states so herself: “The owls won’t see us in here”. Like a shaman, she’s living among the shadows, shining a light of her own in the dark. It seems like her log (which itself originated from a fir in the area around Glastonbury Grove) needs to be close to this in order for the Log Lady to receive its messages. Just as Major Briggs receives his. Margaret is a strong spirit and a bearer of light. When she dies, her cabin turns dark. Mountain Symbolism. Mountains are the thrones of the earth and as such, they have always had important symbolic roles to play in every human civilization known. The way I see it, it’s clear that Frost and Lynch not only wanted mountains to be featured in the TV series they once sat down to create together, but it’s also highly significant that they chose to place their drama in and around a town between two mountains and to name that town Twin Peaks. The whole underlying theme of Twin Peaks has to do with duality and “everyday mysticism”, both represented in a physical form by the two mountains. With the creators both being explicitly interested in the esoteric and mythological it is only fair to take at least a brief look at some of the traditional importance of mountains from different world civilizations and religious beliefs. Mountain peaks – The top of a mountain is generally regarded as a symbol of communication with the spirit world and a chance for a person to pass to other, higher dimensions. In other words: the path to a higher consciousness and a place for the soul to ascend. Two mountains – Interestingly enough, a mountain range which has two distinctive peaks have often been associated with being the home to gods or spirits, making the valley between them a throne of sorts. Sumerian mythology – Two mountains (like above) were regarded as the seat of the Sun and Moon, one on each mountain top. Now, remember that note from Major Briggs, anyone? 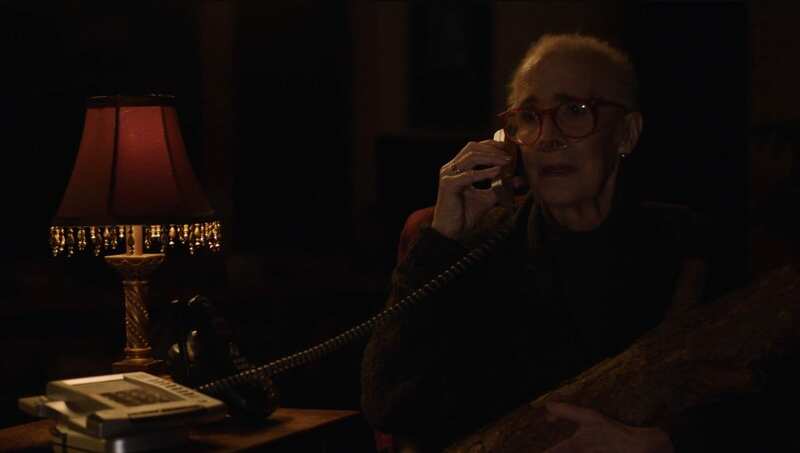 In Twin Peaks – Just a few examples from Twin Peaks regarding mountains that I think about right now (and that I didn’t already mention): When Norma and Big Ed finally unite it is surely one of the happiest moments of The Return. 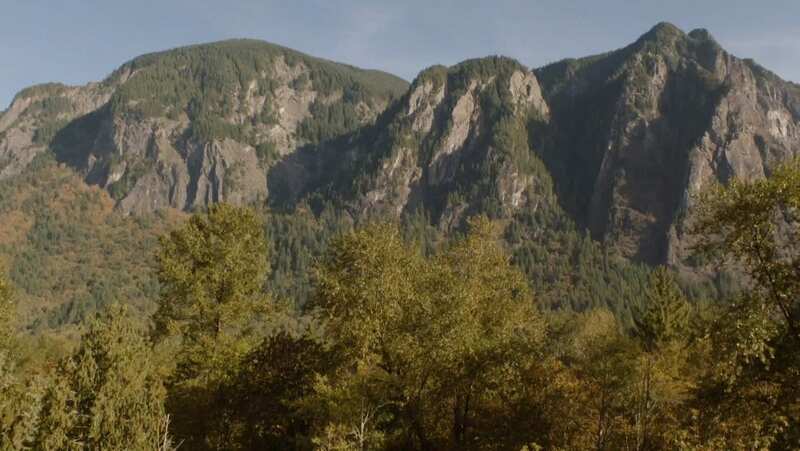 The scene doesn’t end with them kissing and Norma answering Ed that she will, of course, marry him – it continues on with the music and the camera goes up the mountain (White Tail, I presume, as it is closest to The RR Diner). We get to see the sun shine on the steep range and the blue heavens above – not a very common thing in Twin Peaks where mood-setters of rainy, foggy mountains, dark woods and eerily tree branches blowing in the wind are much more common. But the reunion of Norma and Ed is a happy, pure and an enlightening step up for them (and us! ), and the imagery that accomplishes it all is the sunny mountain standing tall underneath the heavens. The last example is a visual observation of the way Jack Rabbit’s Palace resembles the mountain island just mentioned. 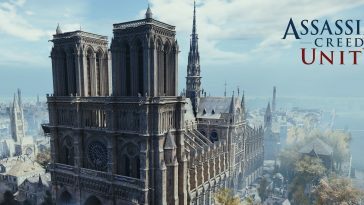 The two places are known to be spiritually connected, but I think they look similar as well. Maybe it is because they share importance, something that’s visible already at Jack Rabbit’s Palace like a clue to what you might meet if you pass through the nearby portal. We’ve witnessed more portals in The Return than we did in Seasons 1 and 2 for sure. Some portals have specific coordinates, like Jack Rabbit’s Palace. I noticed that Andy was spirited away (literally) to the Fireman’s while positioned on the exact same spot by the Sycamore Tree as Mr C later would find, stand on and disappear from, too. The opening of the portal apparently required a very specific position, thus the need for exact coordinates. But there are at least three other portals that I want to mention who you probably wouldn’t find even with coordinates, and I’ll explain why. The first one is the convenience store – or, to be more exact: the above of the convenience store. 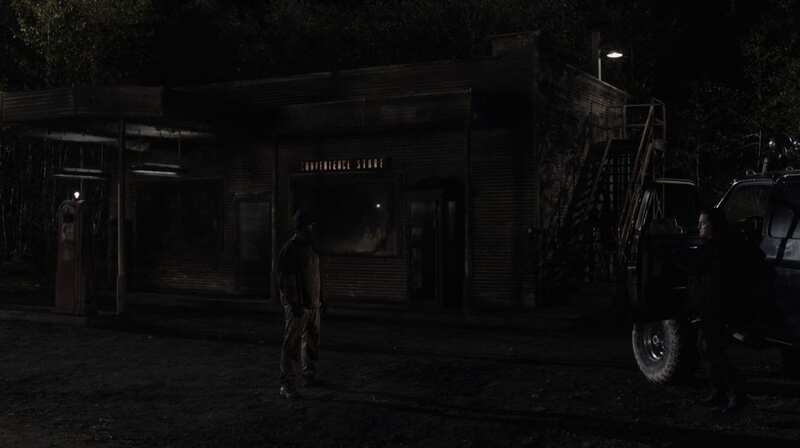 The moment the Woodsman and Mr C are flickered away from the old gas station is when they are walking up the stairs that lead “nowhere”. The portal, as I see it, exists on a spot as exact as the one at Jack Rabbit’s Palace – but it’s not on the ground. You can have as many maps and coordinates as you can carry – the portal is still up in thin air and elevated from the ground. In order to get to its exact location, the convenience store and old gas station must first appear along with the stairs. It seems to me like the key challenge in finding this particular portal is to have the initiated knowledge needed to summon forth the gas station first. Further down I will talk about the symbolisms of caves, and this idea will appear again there. When Freddie is on top of the stack of boxes, he unknowingly reaches the exact spot where the London portal is located. Freddie hints to James that he’s been on this street many times before, yet this time he was spirited away, perhaps summoned by the Fireman (it seems to be the case that he was). The portal exists not on the ground but some distance from the ground, up in thin air. My third and last example is the glass box in New York. And I mean literally the glass box – not the building in general. Not even the inside part of the box, really, but the outside only. When Cooper is falling through non-exist-ence he lands on the glass roof of the box outside of the building. What if the portal in New York is in thin air above the box, and that’s why the box expands to the outside of the building? I think this makes a lot of sense. If you want to catch whatever entity that passes through this portal, and the portal is high above the ground, it seems logical to construct a glass “cage” in this way. Caves in mythologies – Caves are meeting places between the human and spiritual world but also places where one has to face oneself and overcome the challenge that passing through a cave represents. The underground is found in the cave, but the cave cannot be found by anyone. Only the initiated can find its entrance. This is where I connect back to the portal at the old convenience store and gas station, where the key to finding the way inside seems to be reachable only to those who have the ability to first summon forth the building and the stairs before finding the entrance. Because caves were accessible only to the initiated they have often been places of religious rites and other activities of the like. To find the way through a cave symbolizes defeating danger and changing into a higher state. The cave is regarded as the mirror of the mountain – both are cosmic centres and spiritual connectors, but the cave is a place of the descent of the soul that sometimes leads to rebirth – therefore, it also provides new life. As spiritual places, caves, like mountains, are entrances to other spiritual and/or divine dimensions. Tao: The mountain is yin, the cave is yang. Celtic mythology points to caves as the entrances to the “otherworlds”. Native American tribes believed in many caves as layers upon layers of each other, and this system of underground caves symbolized the World. In Hinduism, the cave represents the heart – the place of Ātman, the life force also known as “the cave of the heart”. In Sumerian mythology “Kur was used as a name for the Sumerian underworld, which was envisioned as a dark, dreary cavern located deep below the ground, where inhabitants were believed to continue ‘a shadowy version of life on earth'”. A shadowy version of life on earth. That kind of sounds a little like the concept of the doppelgängers, doesn’t it? Kur will return later when I’ll write about the mythological river Hubur. In Twin Peaks, the first thing most of us think of when it comes to caves is the Owl Cave. Considering the symbolic meaning of caves as “entrances to other spiritual and/or divine dimensions” but also a “place where one has to face oneself and overcome the challenge that passing through a cave represents”, I think it’s fair to say that this fits the description of Owl Cave very well. Because inside the cave and hidden behind stone is the Owl Cave map – basically a key to the entrance to another dimension: The Black Lodge. Now, stop for a moment and think about how mountains and caves are describes as mirror phenomena – yin and yang, or twins if you will. 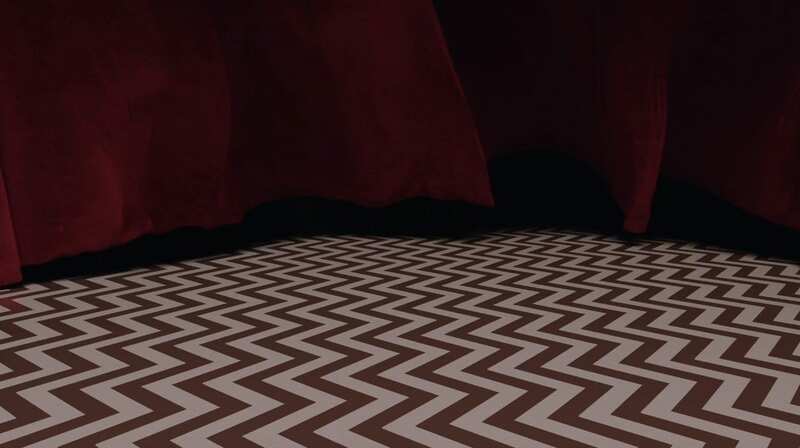 Then, if caves are the shadow selves of mountains, and the Black Lodge is the shadow self of the White Lodge – one might just ask oneself if this a concept to consider applying to Twin Peaks. I really enjoy playing with that thought. There’s plenty of water in and around Twin Peaks, although it’s not as prominent as the mountains. But I’ve thought of the water element none the less, and for quite some time. I’ve also written a little bit about the water element before, but now is the time to dig deeper. A lot deeper. We’re gonna fall and go underground, eventually. First an examination of the symbolic meanings of water from mythologies and spiritual belief. Water symbolism. Very generally speaking water is a symbol of life, fertility, growth, birth, the passing of time, purity, regeneration and the source of everything. Many religions from all over the world have creation myths which include water as a bearer of life, the beginning of everything but sometimes also the destroyer of all, such as in the Great Flood myth. The destruction, however, is circularly connected to life where everything will be reborn again. Water is duality: Chaos and stillness, life-giver and destroyer, drought and flooding. Every known religious system have one or several water goddesses or gods. Some have separate ones for rain, the sea, lakes, snow etc. In Alchemy water is one of the four elements. Native American mythologies tell of water as the source of The Great Spirit’s power. Water spirits are commonly more evil than good. Celtic water myths include The Lady of the Lake (who is said to have given King Arthur his sword, something I have previously written about as well). An ocean stands for chaos, movement, change, the unfathomable and The Great Mother. The Great Mother is a general term referring to the greatest goddess of any religion or cult. She’s almost always the goddess of fertility, nature, water, the Moon, destruction and the origin of all life. 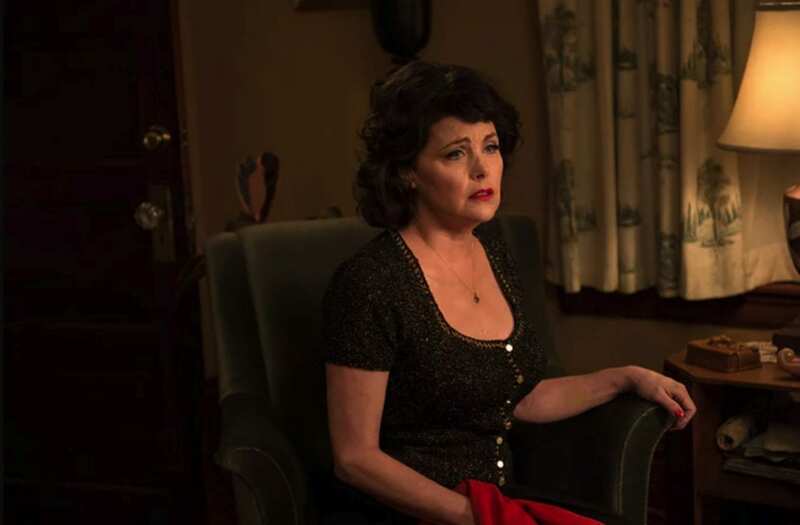 (I realize that some readers will jump just to read the word “mother” in a Twin Peaks context, but this is not the time nor the place for a deeper dive into the subject. If you’re interested in reading more, go from here and continue on by yourself.) The river’s mouth, where a river meets the ocean, is also symbolized by The Great Mother. Islam: Ocean symbolizes eternal wisdom. In the Sumerian myth of creation, the world was created when the waters of Tiamat (the salt water) and Apsu (sweet water) united. A river represents life and death. Many civilizations have myths about rivers of life and rivers of death. A river symbolizes the passing of time, and it’s where the expression “time is running out” has its origin. A river also represents spirituality, cleansing and the manifest world. The Buddhists believe that in order to reach enlightenment, one must trace a river to its source. The river’s mouth symbolizes a passage, gateway or door: it gives access to other realms, but must first be conquered since it’s believed to be connected to danger and high risk. The symbolic meaning of waves are that they represent chaos, illusion and change. Yes, between the twin peaks. Waterfalls are connected to rivers (not only in nature, but also symbolically) and they therefore stand for the passing of time, fertility, change and movement. However, the dramatic nature of waterfalls also give them extra meaning: A waterfall represents descent, which can be both positive and negative. The Hindus believe the descent of the higher consciousness down to the human mind is a positive symbol of a waterfall, but at the same time, the waterfall might also represent the downfall of the soul or mind. Falling water manifests the movement of matter and time in a brutal, yet divine way. They are therefore often sources of admiration, wishes, prayer, offerings and the search for truth and refinement. 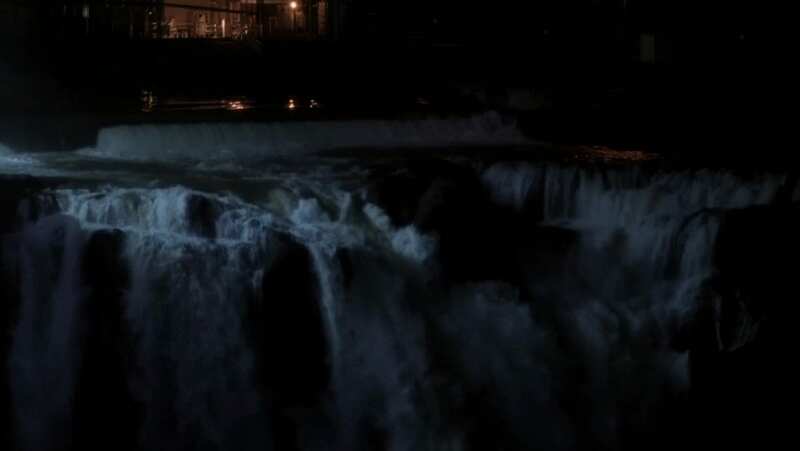 Waterfalls are breaking down something that may then be reborn, regenerated or destroyed. Non-exist-ent. When Cooper leaves the Black Lodge in Part 2 of The Return it’s not a peaceful trip. He’s literally scared out of the lodge by the doppelganger of the Arm The floor is moving and then it opens up. Cooper falls down and is submerged in dark, unfriendly water. A moment later the water we saw is gone. Cooper is now falling through space. Like the waterfall he descends, and like the ocean the dark void around him is chaotic and unfathomable. Red waves. 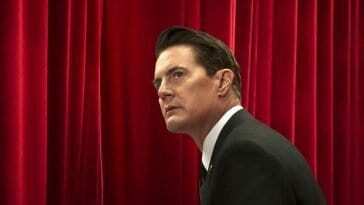 In The Return we get to see something entirely new happening in the Black Lodge. Sometimes the red drapes move. Technically, they do this in all 18 Parts because they are depicted in the opening credits. The way they move resembles water: falling like waterfalls or waving like an upset stream. 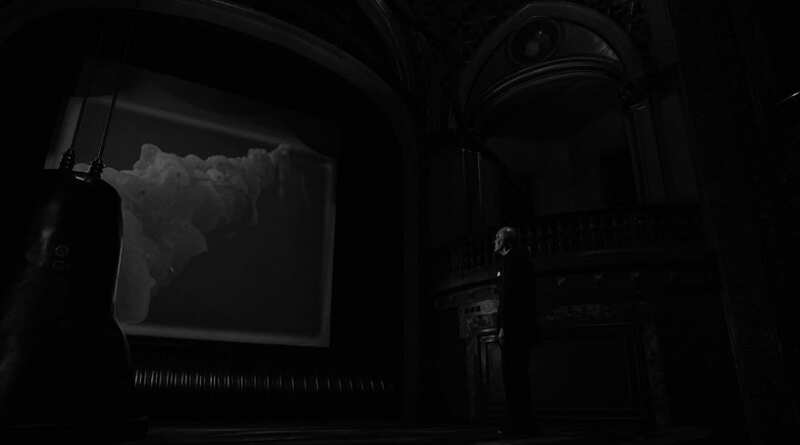 In the intro, the images of the red drapes are even faded in from the footage of the waterfall. Pearl Lakes. This is, as I already mentioned, where Leland Palmer met his fate in Bob who possessed him. Near Pearl Lake lies Glastonbury Grove. This is also the place where the Log Lady, Carl Rodd and a third child named Alan Traherne were abducted and disappeared for a day in 1947. The ashes of Dr Jacoby’s brother Robert and those of the Log Lady were scattered. Pearl Lakes is clearly a spiritually charged location – like the water element it’s both mysterious, unknown, horrifying and a loved place to which people are drawn. Ducks on the lake. The Black Lake is where Annie and Cooper go for a romantic rowboat date. Like in the big Ed and Norma scene, love is in the air and in the water. Pretty much everywhere. Until we see Windom Earle standing on the shore stalking the pair with his binoculars. Just like the element of water, this situation on the lake is potentially both constructive and destructive. The Violet Sea. The sea or ocean surrounding the mountain island of the Fireman and Señorita Dido is vast, violet and seemingly in uproar. Like the symbolic meaning of any ocean this is a mysterious, chaotic and wild place. Yet, inside, there’s calm, symmetry, stability and order. It is a duality world in and of itself. In combination with the color violet, the understanding of this place deepens. Violet is often associated with knowledge, intelligence, truth sanctity and temperance. 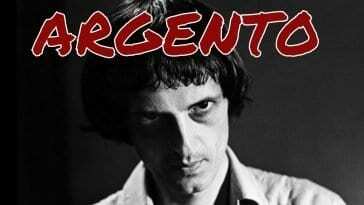 But it is also the color of grief, sadness and penitence. In the Roman culture, violet is the color of the planet Jupiter. We’ve met Jupiter before in the Owl Cave map. When in conjunction with Saturn, the door to the Black Lodge is said to be open. In Alchemy, Jupiter is associated to manifestation, optimism, goodness and a higher mind. 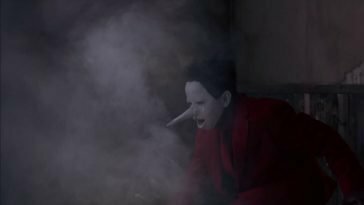 When I wrote my Twin Peaks and Alchemy article in June 2017 we hadn’t yet seen Part 8 of The Return but only the short scene with Cooper and Naido meeting in the violet world. Yet, back then, I interpreted Jupiter as “A planet connected to the White Lodge”. Many now believe that the place where we see the Fireman and Señorita Dido in fact is The White Lodge. Consider the green Saturn lamp in the Black Lodge for a moment and ask yourself if these things are coincidences or not. Maybe it doesn’t matter if they are, since everyone’s interpretation and understanding of Twin Peaks will be slightly different anyway, but for me, this could just well be intentionally arranged. Water of the dead. Teresa Banks, Laura Palmer and Maddy Ferguson were all found in or right next to water. Laura was found (and wasn’t found) by the shores of the Black Lake. In Fire Walk With Me Teresa’s body is seen floating down a river. In Maddy’s case she was put in the water right by the White Tail Falls. Right after Maddy was killed, but before she was found, Philip Gerard (Mike) escapes his hotel room and is later found “by the waterfall” (Harry Truman, season 2, episode 8). (Mike was probably trailing Bob, just as he showed up in the morgue after Laura Palmer’s autopsy.) This will not be the last I write about Gerard and the waterfall. Water causes Bob (a fire entity) to throw Leland into his last manifestation before dying. 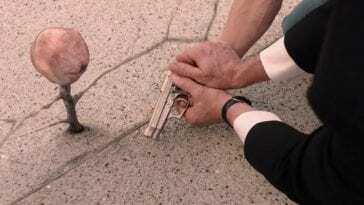 Why Leland would choose to shoot himself close to his place of employment, I don’t know. I’m not claiming to have an answer here, something like, say: “The waterfall is a spiritual connector and Leland was drawn to it” – but keep this fact in mind. If there’s something more to this or not I will eventually leave up to you to decide, but for now, I find it interesting that White Tail Falls, of all places, would be Leland’s choice of location to end his own life. The reason for his suicide was, after all, that he missed his missing daughter Laura so much that he couldn’t stand it any longer. There are certain visual elements in Twin Peaks that keep coming back over and over again. Figurines of ducks, mounted fish, forest pictures, wooden panels, taxidermy deer, designer lamps, flower patterned curtains, clothing and wallpaper and so much more. Those things, however, are not on my radar right now. The waterfalls are. I’m not referring to the actual White Tail Falls but depictions of it. If we look closely we can see them here and there, but it is their presence in certain situations that I find interesting. That mysterious sound that Ben and Beverly hear in the room next to Ben’s office. We learn that the sound seems to be loudest in one of the corners, the same wooden wall that the camera eventually zooms in to when the scene ends. Watching the scenes from Ben’s and Beverly’s offices I can determine that on the other side of the same wall where the sound is best heard another framed photo of the White Tail Falls is hanging. Could it be? There’s something behind that waterfall. 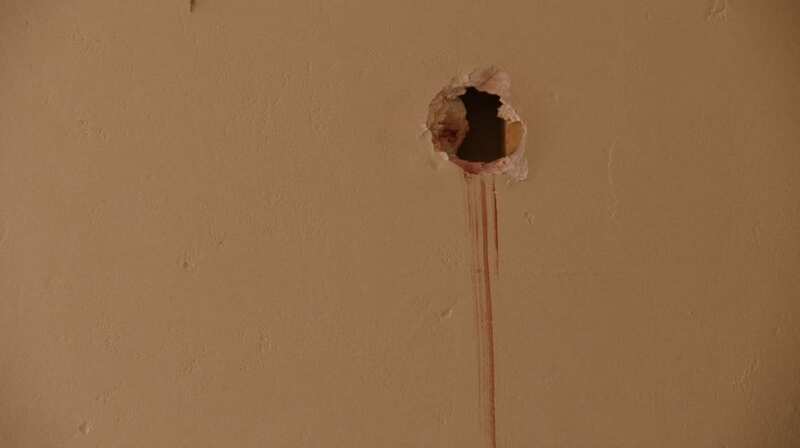 A mysterious sound, a hole in the wall. In Part 14, we see James going town to the basement of the Great Northern to check the furnaces. He notices the same sound, but it clearly seems even louder downstairs. The camera ends this scene by lingering just a moment on the basement metal door. There’s something behind it, but what? Later, in Part 16, we’re no longer in Twin Peaks but at a hospital in Las Vegas. Bushnell Mullins is by Cooper’s hospital bed when he’s distracted by the same sound. It makes Bushnell leave the room. We all know what happens next: Mike appears as a Black Lodge projection and Cooper wakes up. It’s now clear to me: Mike is causing the sound. This is the sound of Mike. If the sound was bound to the Great Northern, it wouldn’t appear in Vegas. Furthermore it seems like this sound has the power of summoning and mesmerizing people. Ben, Beverly, James and Bushnell, they’re all spellbound by it. Bushnell, however, is the one who’s most affected. The sound makes him leave the room. I understand it now: Mike used his sound to make Bushnell go away, so that he could wake Cooper up and have a talk with him without disturbance. But what about the basement in the Great Northern Hotel, then? The answer, of course, comes at the end of The Return. Once Cooper, Gordon and Diane arrive outside the basement door (the same one we saw in the scene with James) and Cooper unlocks it with the 315 room key, the sound culminates. Behind the door, Cooper finds Mike and the sound is gone. Cooper has found the source of the sound, and the sound has summoned him successfully. It is now no longer needed. What is that sound? I mean, “off screen” and “in real life”? I feel confident that I know the answer: it’s the sound that Tibetan singing bowls make. The similarity isn’t explainable with words, so please listen to the sounds yourself! Also, do yourself a favor and take a look at what happens when you put water in a singing bowl. The sound waves create a macro-cosmic sea complete with waves and “inverted rain” that covers the surface with dancing water pearls. It’s beautiful, and it’s interesting to think about in the context of this article, isn’t it? What character kind of resembles a bell? The same person that Cooper eventually meet after the sound leads him to Mike: Phillip Jeffries. At least, the thought is intriguing. This could have been a description of what Cooper is doing, or what he’s trying to do. To overcome death, to be on a quest, to understand and redeem the dark side of man’s nature. In fact, the same thing could be said about Mr C, even if that journey, as you know, is very different from Cooper’s. 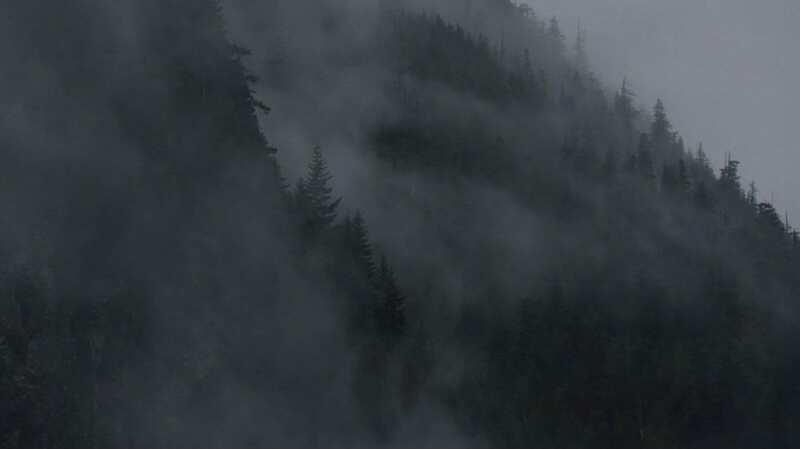 Not only the fire, but the waters, mountains, air and the caves (sometimes symbolized by underground spaces) all have a deep mythological meaning in Twin Peaks. But the specific thought that made me dig into this article was a hunch I had that there was something more to the recurring combination 1: the White Tail Peaks waterfall, 2: the mystical sound and 3: the idea of descent in order to find answers. There’s a portal underneath the ground of the Great Northern accessible via the basement. From the angle that we’re shown the hotel’s exterior, the basement is located behind the waterfall. The underground portal of otherworldly “caves” symbolically represent the spiritual mirror world of White Tail Mountain close by. As above, so below. What Glastonbury Grove is to the Blue Pine Mountain, the Great Northern basement portal is to the White Tail mountain. Looking extra close into the Sumerian mythology is logical since Mark Frost brings it up in The Final Dossier. The river and waterfall near the Great Northern and the portal in the basement symbolically and highly resembles the Sumerian river Hubur that leads to Kur – the entrance to the Underworld. Twin Peaks has an Underworld. It’s not necessarily existing underground in a physical form, but some of it’s entrances or portals are. The Underworld is the doppelganger mirror world where entities and spirits reside. Some of them can leave this realm temporarily, and I believe that’s what we see happens in the glass box in New York, in Dougie Jones’ house (as a sort of projection), by The Zone in South Dakota and so on. The Underworld can be visited by “mortals” such as Bill Hastings, Major Briggs, Cooper, Annie, Windom Earle and others – but just as in the case of visiting a cave, or the Hindu symbolism of descending waterfalls, it is potentially risky and dangerous to do so. Researching for this article I wanted to find out more to see if I could make further connections, and I’ve tried to present my thoughts and findings here in an accessible way. As always, the things I write are theories and not answers – and as theories, they may be subject to change or further thoughts from myself and others. Therefore, please feel free to comment and to tell me what goes through your mind while reading mine, whatever it might be. Dear Gisela, a heartfelt thank you for this. Actually our minds work in very similar way, and you had this great initiative of making an amazing focused research, which enhanced my knowledge and helped to organize some ideas. I would like to share an anecdote: in New Years Eve from 2016 to 2017, I was with my older sister, who hás some knowledge in the matter, and she tripped and fell on the flor hitting the center of her forehead. Fortunately she was okay, and the only injury was a headbump. 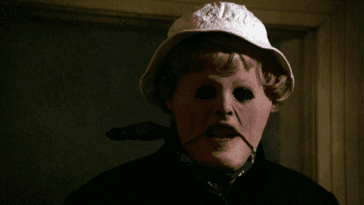 She mentioned that it was also funny because she randomly saw some where that a hit on the for head is an initiatic practice in some secret societies. I was also appalled when I saw the head bumps both from Coop in the final episode of Season 2, that is also preceded from Ben Horne’s non intencional fall and hurting himself in the forehead too, by the fireplace of his office in the Great Northern. I just thought “Wow, they are awakening to their own darkness and both descending”. Your article eloquently describes how the descent into darkness and intentions behind can lead to different resulta: enlightment of the soul or further darkness and misdeeds (Mr. C after 25 years of misdeeds and games, no longer hás the spasmodic creepyness of BOB, linked with over expression without wisdom basic instincts of survival and lust – always through power and overpowering). I could not find anything in Google (via several key word researches), but I wonder if it is something you stumbled upon your through researches and comparisons? Hi Helena, and thank you for your anecdote! Thank you Gisela! Keep up the good work and inspiration. It’s going to be ending of mine day, but before ending I am reading this great piece of writing to increase my know-how. I’m only at the moon section of your article, but have you seen this tweet? Finally finished the article, and I admire the effort you put into it. When the fireman shows Andy a shaking image of Lucy in the sheriff station, I interpreted this as foreboding an earthquake. Absolute brilliant. Great article, no doubt. I see all the show is perfectly developed and studied by Frost and Lynch. Even the little details, all linked with astrology or ancestral culture: Greek, Roman and so on.